This podcast series is designed to help small business owners of all types (including authors, writers, and other creatives) build an online audience without all the “icky” marketing. Instead, we use content marketing to create connections and build the trust of your audience. It’s a much more ethical, “soft touch” approach, and a part of your overall content strategy. See the sidebar on the right or click here for a complete list of episodes. In the 5 years of running my own business, I’ve learned a lot about how to best serve my clients. Content strategy encompasses a very wide range, so I provide a wide array of services. After all, each client is different. But they all have one thing in common: My clients are building an audience using content. They are usually small business owners, authors, or writers. In other words, entrepreneurs of all types. I help them with everything from strategy to tactics. Setting goals based on clear business objectives, building a strategy, and then executing it. Everything from writing, production, and deployment to measuring the results and iterating. The purpose of this podcast is to show you how that’s done. I give you an overview of the principles behind content strategy to get you thinking about your own business—and I include questions and issues that come up in the real world working with real clients. I publish a new episode most Mondays. My goal is to teach you everything I know about content marketing, 10 minutes at a time. 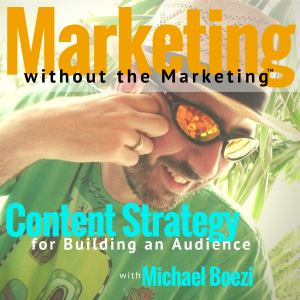 Marketing Without the Marketing is syndicated on nearly every podcast app. Let me know if it’s not on your favorite app, and I’ll see what I can do. Lastly, please leave a comment or review – and most of all, ask questions! If there’s something I didn’t cover, I’d love to help you. Or maybe your question will even be the topic of the next episode! 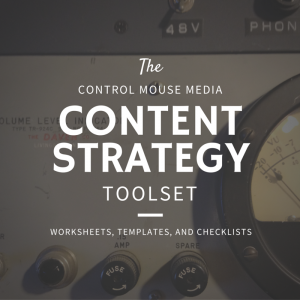 The tools and templates that I use regularly in my own content strategy – and with my clients too. It includes planning worksheets for publishing optimized blog and social content, and then monitoring and measuring your progress.